The costs and logistics of a large group travelling together can be a nightmare. Bus and train routes often do not accommodate certain routes, areas or communities and when they do the prices can be astronomical. With the absence of group booking discounts in many forms of public transport, the price of travelling in high numbers is often hard to justify. This is where private hire by Atlantic Travel can be incredibly helpful. The high volume of passengers that we can accommodate creates a cost effective solution to group travel. Wherever your party is going; Atlantic Travel can provide stress-free travel solutions. Many forms of public transport are at the mercy of a great number of variables that impact upon performance and standards. Delays and cancellations are almost a running joke amongst those who travel by train due to their frequency. Signal failures, staff shortages and a myriad of different reasons can have a knock-on effect causing problems throughout train routes. Ensure punctual arrival at a private engagement or an important function by organising private transport. 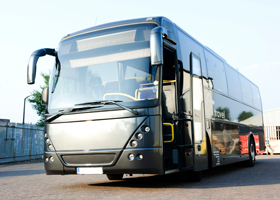 Private hire coach travel helps ease the organisational nightmare that can be getting a large group of people from A-B. Events such as weddings can benefit greatly from the implementation of private hire coach travel. Everybody travelling together alleviates to stress of organising different drivers and travel groups. Atlantic Travel private hire can help take the stress out of travelling to and from such events and allow you to concentrate on the main event itself. Our fleet undergoes strict and rigorous safety inspections once every 6 weeks.